The Budweiser Clydesdales are iconic representatives of the Budweiser brand. They're household names, and you're likely to see them at major parades and festivals all across the country. But what is life really like when you're a Budweiser Clydesdale? And how do you become selected for the Budweiser hitch in the first place? Have you ever wondered just how Budweiser Clydesdales are chosen, cared for, and transported across the country? This video provides a look inside the Budweiser Clydesdales' lives. This footage was filmed at the Anheuser Bush factory, located in Fort Collins, Colorado. The Clydesdales spend a few weeks there each year, but most of their time is spent traveling. Shipping these horses is no small feat. According to the Warm Springs Ranch website, the Clydesdales travel in 50-foot tractor-trailers. The tractor-trailers are equipped with air ride suspension so the Clydesdales have the smoothest ride possible. The entire team of ten horses travels in three of these trailers, and they stop every night at a stable so the horses can get a good night's rest. Warm Springs Ranch, located in Missouri, is a breeding farm for the Budweiser Clydesdales. The facility was established in 2008 and encompasses 300 acres. Approximately 70 Clydesdales are housed at a time, including mares, stallions, and foals. Not all Clydesdales get to be Budweiser Clydesdales; there's a detailed selection process. Budweiser Clydesdales must be at least 18 hands high and must weigh between 1,800 and 2,300 pounds. All Budweiser Clydesdales are geldings at least four years old. Budweiser Clydesdales must be bay, and they need to have four white stockings and a blaze on their face. Want to meet the Budweiser Clydesdales? The Clydesdales make appearances all over the country, and often you'll have the chance to meet them when they're not on duty. Warm Springs Ranch also offers tours, but you're encouraged to book your tour early because they do fill up quickly. 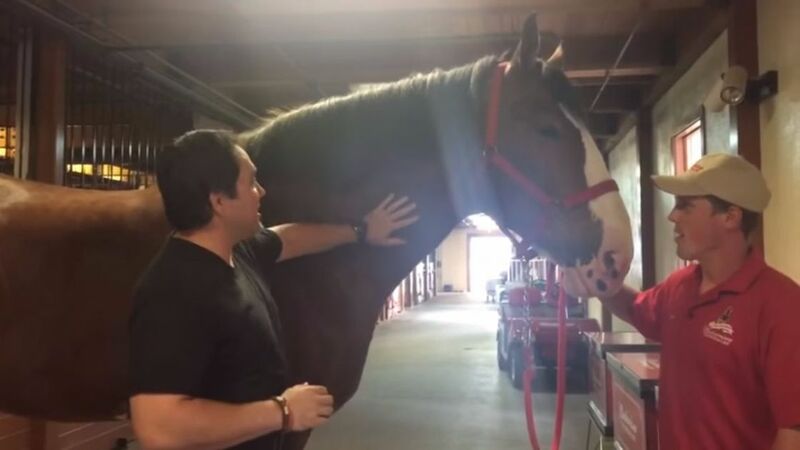 With such large, majestic animals, it's no wonder the care and attention to detail that goes into making sure the Clydesdales are always at their best.